Egypt is the Hollywood of the Middle East. From the 1950s onward, Egypt established itself as the Arab film industry's home and earned the favor of Arab cinema goers for its multitude of quality productions. As the Arab Pop Culture landscape has changed in the past 15 years with the rise of satellite television networks and growing popularity of television soap operas, مسلسلات, Egypt remains a huge producer of films. Among the classic works of Egyptian cinema is the historical epic الناصر صلاح الدين Saladin the Victor released in 1963 by Producer-Director يوسف شاهين Yusef Shaheen and starring أحمد مظهر Ahmed Mazhar as Salah al-Din Al-Ayyubi. Saladin the Victor depicts The Sultan Salah al-Din, known in the West as Saladin, and his military campaign to reconquer and then defend Jerusalem from European Crusaders in the 12th Century. The film focuses on his confrontation with Richard the Lionheart during the Third Crusade and uses the backdrop of Holy War to compare the Muslim and Christian 'religious personality', epitomized by Salah al-Din and Richard and their respective cohorts. I had never seen a Classic Arab film before, and like most Classic films, Saladin the Victor was lacking the visual smoothness we Americans are accustomed to from today's movies. The editing is jerky, the sound inconsistent at times, and the special effects, especially in battle scenes, leave much to be desired. But all of that is excusable, taken within the context of the 1960s. The money and technical expertise available in Egypt at that time paled in comparison to Hollywood. However, like Classic American movies, Saladin the Victor presents viewers with excellent dialogue, which drives storyline. The language in this film is fantastic, which is no surprise considering Nobel Laureate Naguib Mahfouz supervised the film's screenwriting. The script is written in what could be called 'theatrical Arabic', a kind of simplified Standard Arabic which, in Saladin the Victor, is spoken with the inflection of Egyptian dialect. This style was popularized by Egyptian playwrights in the early 20th century as a way to create sophisticated literary art that reflected daily life. As a result, the film's actors deliver their eloquent lines with natural ease and grace, not sounding forced and stilted as can happen when one speaks Standard Arabic with its full inflection. The film's content and storyline also provide us with a fascinating view of the Egyptian national consciousness in the 1960s. Released in the middle of Gamal Abdel Nasser's reign as Egyptian President, the film, especially early on, is rife with Pan-Arab nationalist allusions. During his campaign to recapture Jerusalem, Salah al-Din repeatedly exhorts his soldiers and officers that victory can only be achieved through "Arab unity" وحدة العرب. 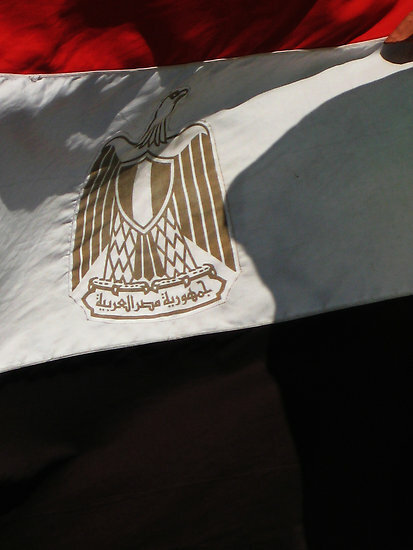 The 'Saladin Eagle' and emblem of the Egyptian Republic, as seen on the Egyptian flag. It is true that Salah al-Din, ethnically Kurdish, led an army of united Arab forces from Egypt and Syria. Yet, there is no doubt that the film's emphasis on "Arab unity" bears a connection to 1960s Egyptian politics. Salah al-Din had been a symbol for Egypt's nationalist revolution in 1952, with the Salah al-Din eagle, his emblem as Sultan in the 12th century, adopted as Egypt's national emblem in 1953. More so, it was only two years before the film's release that Syria seceded from the United Arab Republic, betraying Egyptian President Nasser's own calls for "Arab unity". Saladin the Victor's Pan-Arab overtones overwhelm a story that is typically depicted as a conflict between faiths. As Westerners are familiar with it, the Crusades were fought to reconquer Jerusalem and the Holy Land from the Heathen Saracens, Saracens being a racially-loaded Medieval Christian term for Muslims. This confrontation between 'pious Christianity' and 'Heathen Islam' was connected with European ethnic identity. Arab Muslims were often depicted as oppressing Jewish and, more importantly, Christian minorities, assumed to be more culturally proximate to Europeans. This perception of Arab-Islamic culture had a powerful influence on Medieval European identity which continues to be felt to this day. As we see in Saladin the Victor, however, this view of the Middle East was not entirely accurate. The predominately Arab Muslims, who had governed Jerusalem since the 7th century, respected the presence of Christians and Jews in the Holy Land and throughout the Islamic world. Arabic, essential to Islam, also became the region's lingua franca and was adopted by non-Muslims, either by choice or social, cultural or economic necessity. Identifying as an 'Arab' did not necessitate one's conversion to Islam, as attested to the great number of Arab Christians and Jews whose communities persist to this day. This disconnect, between the European Crusader mentality and the Medieval Middle Eastern cultural reality, is best depicted in the relationship between the characters 'Aissa al-'Awwam and Louise de Luisgnan. 'Aissa is an Arab Christian and Lieutenant of Salah al-Din, who falls in love with Louise, a female Crusader. After Salah al-Din's reconquest of Jerusalem, 'Aissa asks her to be his wife. Louise refuses, saying, "What, me? A wife of an Arab? ", storming off, able to leave peacefully and return to her compatriots. As she's leaving the city, 'Aissa chases after her and explains passionately to her how "the Arabs", unlike the Crusaders, truly respect Jerusalem's religious importance. The conflict between European Christian and Islamic values is highlighted later in the film in a scene whose thematic value is matched by its cinematic creativity. In this scene, we witness two trials depicted as occurring simultaneously. The first is of Louise, charged with treason after aiding 'Aissa's escape from the Crusader camp after his capture in a raid to kidnap the treacherous Wali of Acre. The second is that of the very same Wali of Acre who was kidnapped by 'Aissa and other Arab soldiers from his fortress after betraying the Muslim forces in the earlier battle for Acre against the Crusaders. The scene begins with Conrad of Montferrat detailing Louise's treachery, a treachery caused by her love for Aissa. This love, he asserts, caused her to lose her "righteous hatred" - الحقد المقدس and also الكرهية المقدسة - for the enemies of Christianity. He goes on to say that Louise's love eradicated the hatred from her heart, which caused he to forget the traditions of Holy War, which can only be won through "righteous hatred". The camera then switches to the Wali of Acre's tribunal, in which Salah al-Din charges him with betraying his Arab brethren and having forgotten his love for his brothers in faith and arms. Here, love is valued, and hatred detested. As Salad al-Din states, it is the Wali's hatred which made him abandon the traditions of chivalry and betray his people. As the two trials continue and intensify, the camera then zooms out, showing us a theater stage on which the trials are taking place simultaneously. At the climax of Conrad's arraignment of Louisa, Salah al-Din suddenly addresses him, accusing him of having forgotten that hatred only leads to one's self-destruction. In response Conrad offers an obstinate denial, declaring again: "There is no victory without righteous hatred". This scene typifies the film's portrayal of the Crusaders' intentions. Some, like Conrad, are corrupt, driven to war by greed and the lust for power. Others, like Richard, are blinded by their self-righteous commitment to defending Christianity and unable to see that, in fact, Arabs posed no threat to Christianity. To this end, we are shown that the Crusades were really a war against the Crusaders' own imaginations. While Saladin the Victor takes an unequivocally pro-Arab stance, its depiction of the Crusaders is not wholly negative. The Christian foot soldiers are shown as normal, pious people, driven by their faith rather than greed, to wage war in the Holy Land. Louise, comes off more as misguided, unable to accept and recognize her love for 'Aissa until the very end, blinded by her commitment to the Crusades and her European blood. Saladin the Victor is by no means an accurate historical account of the Crusades, but it is valuable, not only as a film, but also for its portrayal of this well-known historical conflict from a perspective not often appreciated in the West. The acting is good, and more than anything the dialogue is elegant and sophisticated. At three hours in length, Saladin the Victor is certainly a film of epic proportions, but it is very much worth the time.